This Remembrance Day Bicester will pay a poignant tribute to those who lost their lives in the First World War. As the nation gathers to mark the centenary of the Armistice on Sunday, November 11, the families of people from Bicester who served or lost their lives in the conflict have been invited to register to join the Remembrance Day parade in their honour. 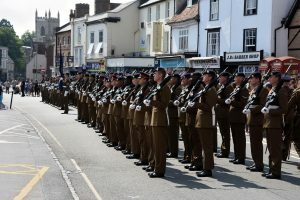 The parade will see hundreds of serving soldiers join veterans, the Royal British Legion and representatives from local groups and organisations, to march down the Causeway, around the Market Square and back to St Edburg’s Church. 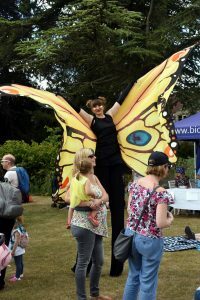 Bicester Town Council is leading the town’s preparations for the day. Councillor Richard Mould said: “We urge descendants and family members of those men and women who served or lost their lives in the First World War to join us in the Remembrance parade as a poignant tribute to their loved ones. 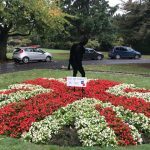 It comes as three ‘Silent Soldier’ silhouettes –a naval rating, an airman and a ‘Tommy’ soldier representing the Navy, Air Force and Army – were installed on the front lawn of Garth Park as part of the Council’s Act of Remembrance. 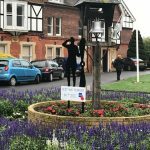 The Silhouettes are part of a movement by the Royal British Legion, RBL, to mark the centenary of the end of the war and thank a generation who “served, sacrificed, rebuilt and changed the nation”. A further six silhouettes have been ordered from the RBL, and these will be placed in the churchyard at St Edburg’s Church ready for Remembrance Sunday. 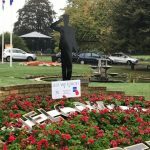 Cllr Mould said: “The Silent Silhouettes are a visual reminder of all those people who sacrificed their lives for our future. On Remembrance Day wreaths will be laid on the war memorial, in the churchyard, followed by a service in St Edburg’s Church from 11am during which a poppy drop of thousands of red poppies will fall from the bell tower in a mark of remembrance. 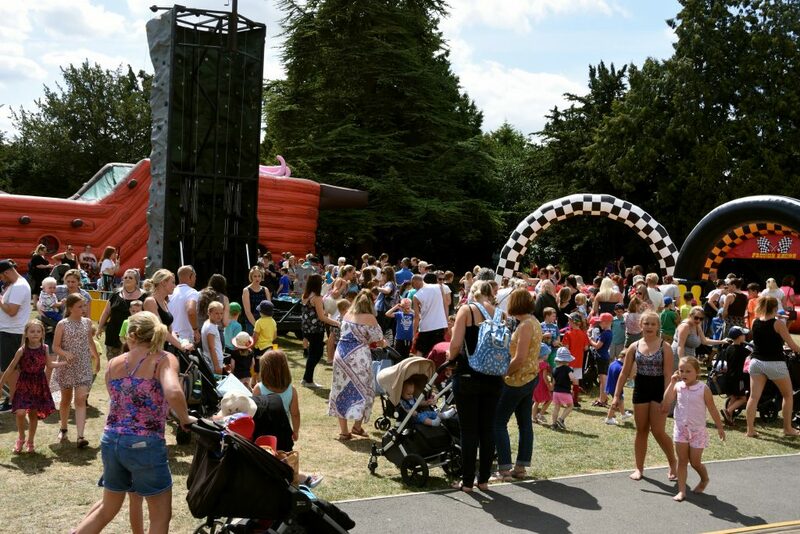 Members of the community who would like to register to join the parade should email Julie Trinder at Bicester Town Council julie.trinder@bicester.gov.uk or call 01869 252915 by Wednesday, 7th November. SOLDIERS were given a hero’s welcome on Saturday, July 21, 2018, as crowds lined the streets to celebrate their regiment receiving the freedom of the town. 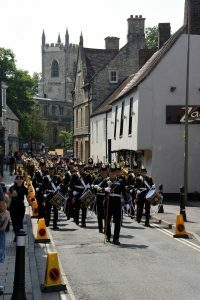 Hundreds of people turned out to watch troops from 1 Regiment Royal Logistic Corps (RLC) parade through the Causeway and Market Square, led by The Band of the Royal Logistic Corps. Union flag bunting adorned shop windows in Market Square and the crowds waved flags in celebration. 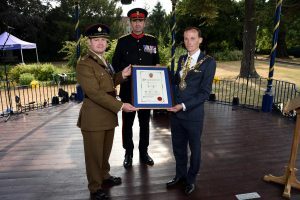 The regiment was given the town’s highest civic honour, the Freedom of Entry, which is a ceremonial decree allowing the regiment to march through the town with swords drawn, bayonets fixed, drums beating, band playing and colours flying. 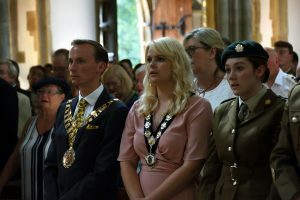 Soldiers paraded to Market Square where Bicester mayor Sean Gaul joined Brigadier Nigel Allison, Lt Col Nathan Crew and Deputy Lieutenant (Retd) Brigadier Ian Inshaw to inspect the troops and take the salute. Brigadier Allison said: “Saturday was a great honour for 1 Regiment RLC, the Royal Logistic Corps and the wider military community in Bicester as a whole. 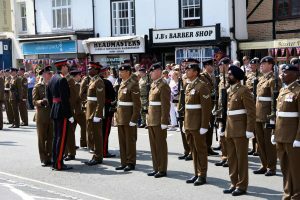 The parade was preceded by a service at St Edburg’s Church, which was attended by officers from 1 Regiment RLC, Bicester Garrison, the DEMS training regiment, soldiers from 1 Regiment RLC, and many local dignitaries including town, district and county councillors, and mayors from neighbouring towns. Opening the church service, The Rev Verena Breed, of the Bicester team, said it was a “privilege and honour” to host the service, and the Rt Rev Steven Croft, Bishop of Oxford, said the regiment was part of the Bicester community and had the town’s “appreciation and support”. There were readings by Bicester’s mayor and Lt Col Crew, and the regiment chaplain, The Rev Paul Green led prayers. 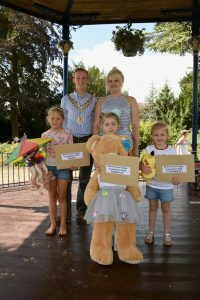 A scroll was presented and signed in a separate ceremony in Garth Park following the parade.